I think one of the biggest differences between commercial artisan bakeries, that bake every day, and the amateur that bakes once or even twice a week is how each handles levain day-to-day. From my reading I've gleaned the commercial baker keeps his or her levain (starter) at room temperature, and feeds it on a periodic schedule every 8 or 12 hours. (I'm an amateur, so, experts, please correct me if I'm terribly wrong). on the other hand, most amateurs keep thier starters at refrigerator temperature (~40°F), and feed them once weekly, or less often. 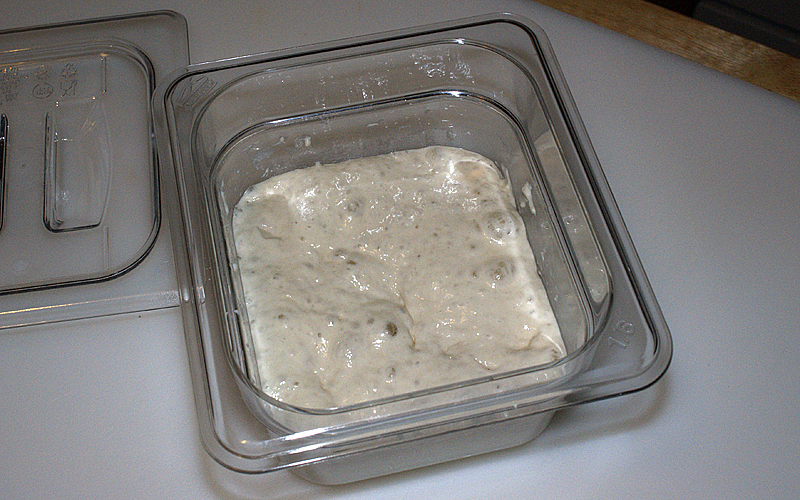 I am less certain how commercial bakers maintain their starters' hydration, I assume, however, that perhaps as little as one day earlier they prepare a chosen amount of their maintained starter by feeding it an amount of flour and water that adjusts its hydration to the target for a days baking. Amateurs keep their maintained starters at a fixed hydration, and, although some amateurs maintain their starters very dry (50%-60%), or very wet (~200%), the usual maintenance hydration is ~100% to ~125%. The challenge for us amteurs is, "How do I convert an alive, but nearly dormant, relatively cold starter to a formula ready starter, i.e., the correct formula specified starter weight and hydration? "; one might also add, in a reasonably short time. 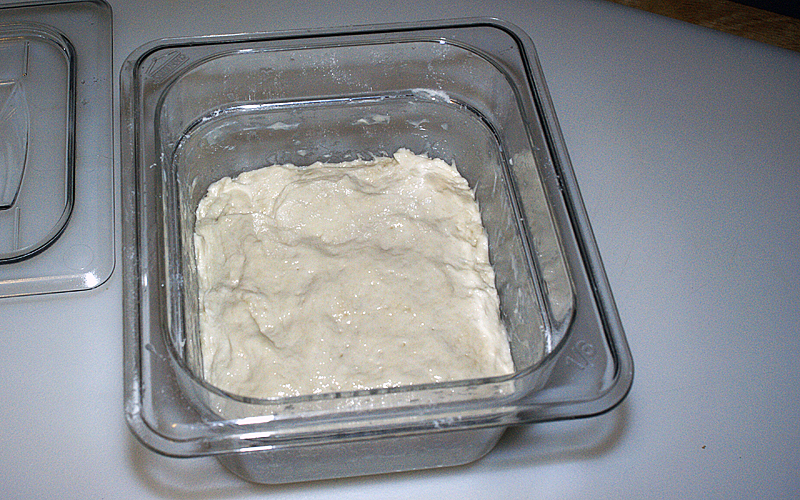 Some recipes intruct a single feeding, without changing the starter's hydration, followed by a fermentation period--usually 12 hours--and adjusts the dough's flour and water weights to achieve the desired dough hydration. 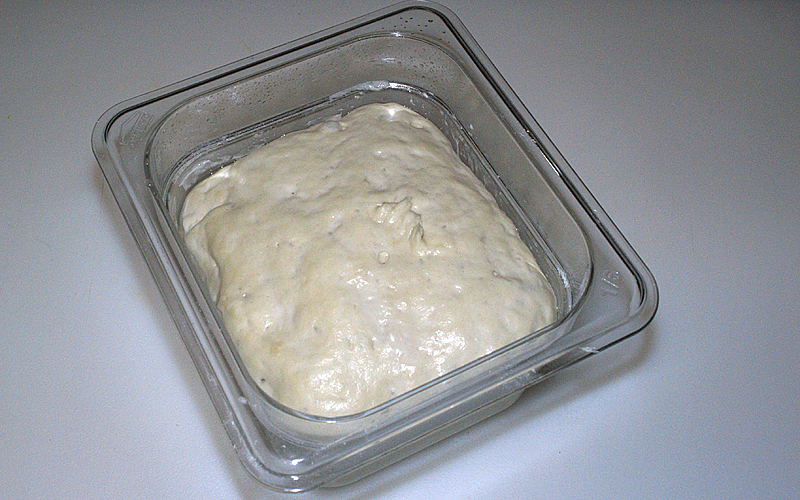 Some amateur bakers convert their maintained starter in one feeding to the target starter weight and hydration, and then feed it an additional one to nine times over a period of one or more days. Both these approaches work, and each have subtle secondary consequences, usually effecting the final bread's flavor. It's not my intent judge the merit of those consequences, merely note they occur. What I want to do is describe the process I use, explain why I use it, and show some results. First of all, I have two primary goals for creating formula-ready starters the way I do. One is related to the final dough. I want to achieve a very active starter, strong enough to produce two strong proofs, in moderately short time, i.e., 2-3 hours each; and with sufficient reserve to provide strong oven spring. And, I want to build this formula-ready starter in no more than 24 hours. The second goal: I want to maintain only a barely necessary amount of starter, e.g., around 200g, 100% hyddration, and fed every two or three weeks. I've succeeded in reaching both goals using a 3-build approach that triples the amount of starter with each build, and adjusts the hydration by one-third of the difference between the maintained starter's hydration and the formula specified starter hydration. seed starter: the weight of maintained starter that when tripled 3 times yields the formula-specified starter weight. Intermediate starter: the building starter, i.e. the starter at any time between the beginning of Build 1 and the end of Build 3.
seed starter weight = formula-ready starter weight/27. But, I always lose some--it sticks to the stirrer, and the its container's walls, so I add a little more, e.g. 20g. intermediate starter hydration = seed starter hydration +(formula-ready starter hydration - seed starter ready hydration)/3 x # of last build. during Build 1 the Intermediate starters hydration = 86.7; during build 2 73.3%, and during build 3 60%. Now, I'm not going to do the Baker's math to calculate the flour and water weights added each build. I built a spreadsheet to do that for me, but it is possible by hand using Baker's math, and the intermediate starter weights and hydrations. The results: Below are a series of five photographs that visually document the example above. 1. 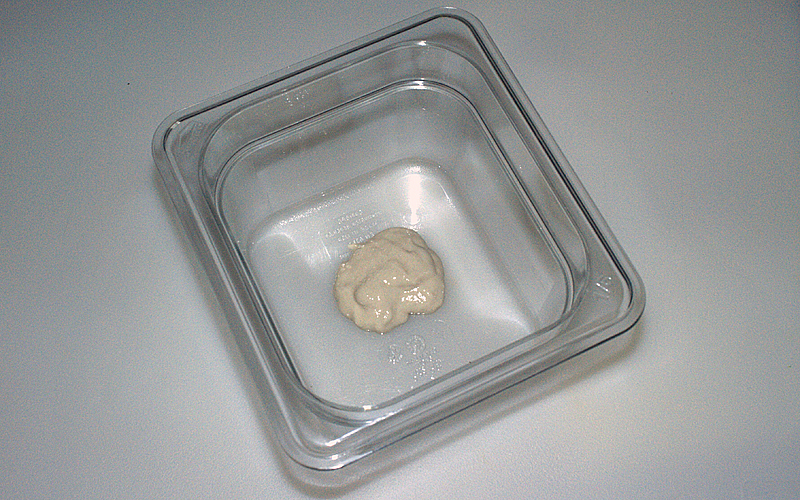 Seed Starter: 19g of my refrigerator maintained starter. 2. Build 2. at its peak 16 hours after starting. I didn't photograph build 1, even at its peak it didn't cover the bottom of the container. 3. 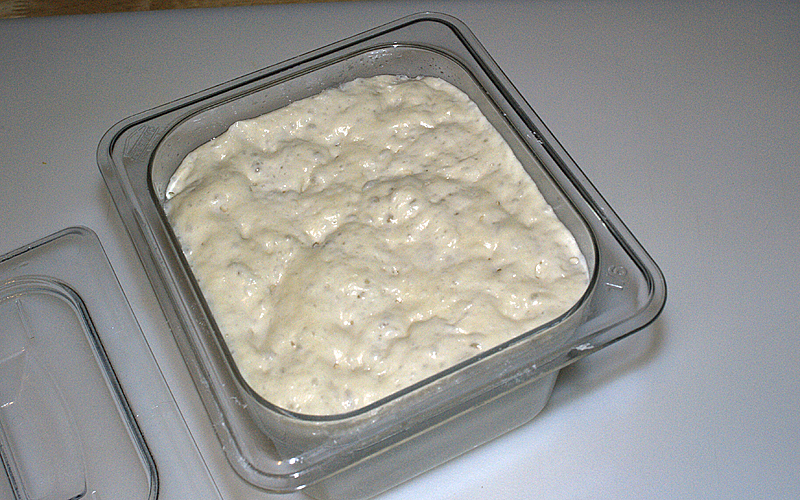 Build 3 at zero hour, I'd just added its flour and water additions and spread it out in its container. 4. Build three after only 3 hours (19 hours from the beginning); I consider its growth a good subjective indicator of its strength. ...for this bread. 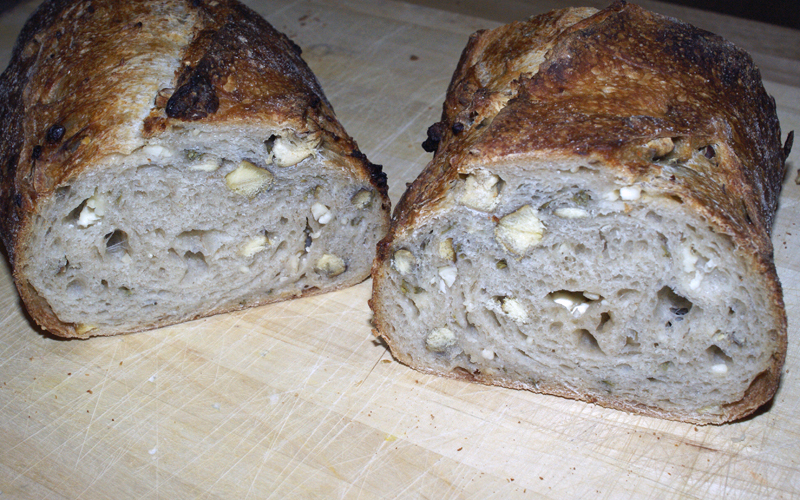 This is D. DiMuzio's San Francisco Sourdough au Levain (firm starter) formula, but I used it for a Thyme-Feta Cheese-Toasted Chestnut vehicle, so it probably doesn't exhibit all the oven spring it might have in an uncluttered dough. Nonetheless, I think it stands a good example of my goal. Congrats! Your bread tells the tale. What flour are you using to refresh your starter, if you don't mind my asking? Unbleached AP, bread flour, or ? 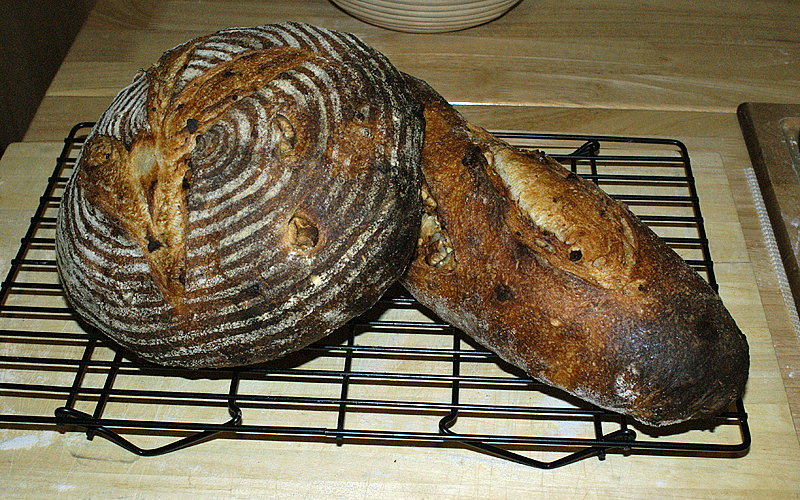 I use King Arthur Bread Flour, exclusively, for feeding my starter, and KA products for almost everything else I bake. I've tried others--Bob's Red Mill, Arrowhead, and health store bulk, but I seem to always come back to King Arthur. It's consistent, reasonably priced, and readily available. Incidentally, I'm a retired sailor. I was stationed in San Diego very briefly in 1958, and visited your home town many, many times since, San Diego is in my top ten list of favorite cities. "it probably doesn't exhibit all the oven spring it might have ..."
And GREAT photos of your process. Very clear. looks divine!!!! One question though....I'm one of those who don't like dark crusts or nearly burned crusts. Is it possible to bake for a shorter amt of time, or somehow protect the loaves? Would tenting prevent that? Nothing I have made so far has gotten that dark yet. I've baked this formula four or five times before, using the same oven settings--480°F for ten minutes with steam, 450*F or 440°F (for large loaves) until finished. I've never experienced the amount of carmelization i did with these two loaves. They were baked seperately. but with same settings (480, 440). Look at other entries in this blog, and you'll see my more usual deep golden crust color, with some darker carmelization where large gas bubbles lie directly under the surface skin. I retarded this dough over night so I'd have a full day to final proof and bake it, but I've done that before too, without thiis result. It may be due to the cheese and chestnut filling somehow chemically interacting with the dough, but that's just a guess. I like the deep carmelization flavor, but my wife's not a big fan. At the end of the day, its a mystery. I just remembered a couple of things I did differently, impulsively, that I didn't make notes of. During the boule's bake, wanting to keep the oven spring going after the lava rock generated steam dissapated, I spritzed the loaf. And, I was concerned that the batard--this was only the second batard I've ever shaped--would dry out, I covered it with a damp towel while it proofed. I noticed the skin was particularly moist when I slashed it. Perhaps, because of the forming crust's more than usual dampness (for two different reasons) more of the skin's flour gelatinized resulting in the darker color. I'm not going to repeat either impluse in future bakes. And, I'm going to buy an oval brotform.